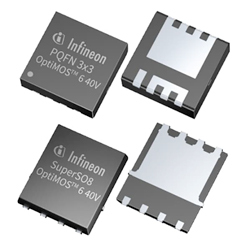 Infineon Technologies OptiMOS 6 Power MOSFETs offer next generation, cutting-edge innovation, and best-in-class performance. The OptiMOS 6 family utilises thin wafer technology that allows significant performance benefits. Compared to alternative products, the OptiMOS 6 Power MOSFETs have a reduced RDS(ON) of 30% and are optimised for synchronous rectification. Further, the devices have improved figure of merits (FOM – RDS(on) x Qg and Qgd) enabling designers to increase efficiency and lessen system cost. The device maintains the advantage outputting a higher power, where the RDS(on) losses are getting more dominant, leading to greater performance throughout the complete operating range.